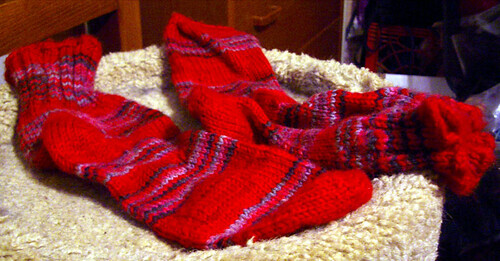 Made with two skeins (one plain color, one striped) of merino superwash sock yarn from Ellen's 1/2 Pint Farm. My own pattern. Oh, the shawl is very cool! I hate blocking. I love the socks, what great colors! This is the first item I've really tried to block. I don't like blocking either, but I do like knitting lace. Thanks, I am really proud of the socks. Unfortunately I used a short-row heel, which isn't very sturdy, so the socks are now worn thin at the heel. The shawl is amazing. I really like the combination of the two yarns. I'm playing with lace again, but nothing that large or that includes mohair, which makes frogging lace errors really challenging. Thanks! 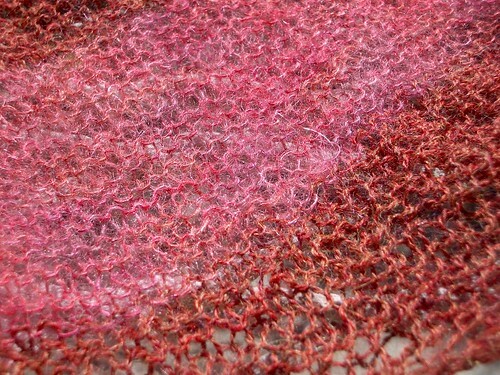 The lace pattern for the Flower Petal Shawl is pretty simple, but I didn't do any pattern in the mohair section; I just used garter stitch and increases. Those socks look so warm and happy! 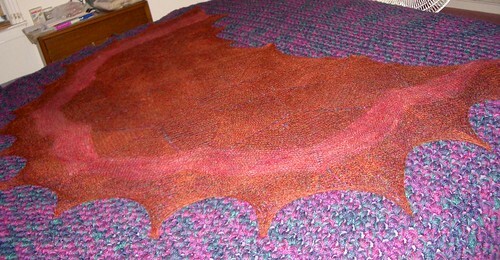 And the shawl, just beautiful.